The new AM Audio preamplifier, "packjammed" between marble and grafitis! With the A-5, the latest preamplifier from AM Audio, Attilio Conti aims at an extremely ambitious goal: to realize something that, for an important -yet not prohibitive- economic effort, could offer in exchange an engeneering and a technical realization inspired by the same ideas that find expression in the wonderful B1 Reference preamplifier (something really state-of-the-art) and, much more important, sporting very high quality level musical performances. OK, good and praiseworthy intentions, but the point is: did he succeed, or not? Yeah, for we don't have any mathematical model, and you cannot take it for granted that a producer, accredited from a past successful production range, can always do it right. So, let's solve this doubt. Your perception is that you are in front of something where high tech harmonically blends with a pleasant handcraftmanship. The new A-5 has the same aesthetic look of the newest AM Audio units - black dress and exaggerated-thick (21 mm) fascia, smartly "doubled" in the central zone, with consistently deep (3mm) amagnetic aluminum structure. Controls are the bare necessity (volume and input selector), and the on/off switch is placed on the rear panel (I suggest you leave it always on - your ears will thank you...), and the operational status is shown by an intense little blue light placed exactly at the front panel's center. The rear side is characterized by an unusual placement of inputs and outputs (double- gold-plated RCA, with teflon dielectric) that clearly reveal the "dual mono" preamplifier's design. There are also two 30V outputs for power supply to other AM Audio devices, like the phono preamplifier or the latest evolution of the tweak that Attilio Conti practices on some TEAC VRDS CD players (VRDS 25-X e VRDS 8). There is a remote-controlled, motorized, volume potentiometer whose infrared sensor is placed underneath the device into one of its feet. Its dimensions are 440 x 65 x 285 (W x H x D), and its weight, similar to a good powered intgrated amplifier, is 8.5 Kg. Inside the A-5 - decisely crowded, but very clean. Looking inside the A-5, you can find two blinded and resin-sunk toroidal transformers, to supply power, beside the audio and service circuitry, and the volume control board, which uses a motorized Alps pot. Input selection is achieved with relays placed directly near the input RCA plugs, so that the signal path is minimized. The output stage, a mosfet push/pull, doesn't present any feedback loop with the remaining circuit, and can give very high tensions, mantaining its Class-A operation even on a 600 Ohm load. The power section is particularly cured, sporting a double RC/RC filter followed by a stabilizer made with a constant-current driven, zener diode that drives a Darlington emitter follower. 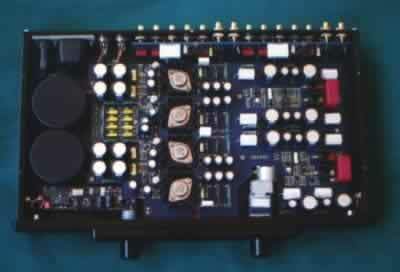 To separate the ripple filtering section from the low impedance one of the audio path, the A-5's circuits are powered by further cells, sporting apparently exaggerated value capacitors and resistors, which are useful to keep a constant impedance for all the audio band, up to its lower limit. The first thing that is evident, listening to the A-5, is its very high transparency, its ability to render the musical message. This improves the feeling of an almost "direct contact" with the reproduced instruments, with not so much that interposes between sound source and listener. Up to this point, we don't have anything particularly special, since there surely is more than one device whose strong point is transparency. But, when this characteristic matches, as in the A-5, further excellent assets such as a nearly total absence of grain (that makes mids absolutely clear and clean), and a full-bodied reproduction that sounds solid and dense as it conveys the musical message (through the entire frequency range), it immediately becomes evident that we are in front of a really high class device. Continuing to listen, I found myself discovering significant differences, never heard before, among the different tracks I played on the CD, and that I thought were very coherent in terms of recording and quality. By the way, I'd like to mention that the audition of some old recordings of mine, whose limits I thought I knew, was the most emotional aspect of the whole test, since they revealed an unexpected freshness and harmonic richness. Thus, I started excerpting from a repertoire that I rarely use for test purposes, and, after having disturbed some of the "sacred monsters" of the '70s, here I was re-discovering (not to cite always the usual titles...) pearls like Angelo Branduardi's "Confessioni di un malandrino" and "Gli alberi sono alti", that were reproduced with such an intensity to take me emotionally back to a yesteryear concert of this intriguing artist - also little and now-forgotten treasures like Mario Castelnuovo's (does anybody remember him?) "Nina" or "Sul nido del cuculo", reach previously never heard dimensions. Dynamic performance is, to say the least, excellent, extremely natural and impactive - I cannot feel any compression limiting the pleasantness of either little or great intensity variation in the musical message. Timbric is full, thick, gloss and very fine at all frequencies, very correct, extremely intelligible, with an extended, stuffy and powerful, controlled and very articulate, fast and sometimes even nervous low range. It's a benefit for the rhythm sense, always up-to-pace, far away from that almost soporiphical effect I sometimes experienced while playing with devices pretending to be "high level" class. Image has high level quality, and it naturally develops toward every dimension. It's perfectly focused even aside from the speakers, where elements are materialized without uncertainty and with the right thickness - they are projected not only behind the speakers, but also in front of them, toward the listener, with an emotional and sharp materialization. Sonically speaking, I really wouldn't know what to complain about. Aesthetically speaking, thinking about their "feeling", I have to say that I decidedly preferred the "old" AM Audio knobs (those found on the PA-30 integrated amplifier or on the 04-N preamplifier, just to be clear, possibly painted with that particular anthrax colour), although I know someone ready to express the opposite position! :-). The rear-placed on/off switch is uncomfortable, although, to tell the truth, I have to say that since the A-5 entered my listening room, I used that switch not more than a couple of times: actually, there are very evident sonic advantages from keeping it constatly on... ;-) Yet, there are also technical reasons to support this switch placement - for one: this way, cables that carry high-voltage AC are not located too close to the delicate preamplification stages. Behind the courtains, a "Special Guest": the Teac VRDS-25X! I was immediately aware I was in front of a product that, considering its transparency and general quality level, was a difficult challenge for the very good (at least, considering its price) quality of my usual reference CD player, the Marantz CD-17. Speaking of general refinement, and particularly for the mid-high range timbrics, the good Marantz was somehow short-of-breath, being pretty cold and raw and, in some critical passages, vaguely "electric". More difficulties come from more complex musical masses, whose reproduction showed some discerning problems. To be fully able to evaluate the A-5's characteristics, taking advantage of Attilio Conti's kindness, I asked and received a Teac VRDS-25X updated to the latest version of the tweak that AM Audio has long been applying to this CD player (there is also a version for the cheaper Teac VRDS-8). For sure, the Teac VRDS-25X doesn't need introduction, being the brand's renowned top integrated model. What I want to underline is that its reading mechanics (the CMK-3.2, simply astonishing when observed inside the player) is one of the most favoured by "Top" gear manufacturers, and it is usually adopted for the finest players/transports worldwide (one name for all - Wadia, with its "Top of the Line" integrated CD player 860x or the wonderful CD Transport 270). In this case, it's coupled to a circuit sporting two AD1862N 20-bit mono dacs and one NPC SM5843AP 8x oversampling filter, with a resolution of 25 bit, and an anti-jitter circuit named D.S.R.L.L. As if its very robust structure wasn't enough (the "Dictionary test" didn't score any interesting result...), it comes with four cone feet with a very large base, to be placed with the point upwards (and I thought I was the only one to use this kind of configuration ! :-), positioned below its standard big feet, where a specific "niche" is present. Consisting of a substitution of the original amplification stages following the digital conversion with A-Class, discrete op-amps, the new tweak by AM Audio, completely replacing the player's analog output stages, is different than the previous one, because it uses a new circuit completely without NFB, either local or total, and is powered, via the 30V plugs placed on the A-5's rear panel, directly by the excellent totally dual-mono power stage of the preamplifier itself (also available, a 12-V version powered by the player's internal power stage). The quality improvement compared to the Marantz, in terms of thickness, fullness and harmonic richness, natural sound and timbric sweetness, was really evident, finally giving a real chance to the preamplfier's gifts of transparency. I was particularly touched by the excellent rendering of interinstrumental silence (mostly with the display switched off), a sound characteristicly usually found only in the finest devices, plus the uncommon care for the reproduction of the finest details. I expected to hear a sharp sound improvement in terms of dynamics, authority, solidity and coherence, and it was so, indeed. What I, frankly, didn't expect -since I already listened to a Teac VRDS-25X CD player with the good ole AM Audio Tweak-, yet I experienced in all its force, is the strong improvement in terms of virtual image. It appears to be extremely airy, firm and precise as I rarely happen to hear. Its concreteness and extreme readibility is helped by the good dark background, counterpointed by the sudden materiality of its elements. Congratulations, thus, to this excellent Japanese-Italian match, thanks to which I could end in the best way, this test of the A-5 preamplifier. If you're after a sweet (maybe it would be more correct to say "sweetened") sounding and euphonic gear, ready to forgive its predecessor's defects (or I'd better say "to hide information"?) and smooth sounding (or I'd better say not controlled? ), The AM Audio A-5 is no good for you, since its basic philosophy seems to be "the Quest for Truth". Being as much coupling-critical as something so transparent, clean and analytical can be, it seems to assume it is connected to devices that have equally highly musical characteristics. If anything is wrong with the source, the AM Audio A-5 doesn't really do anything to hide it. In the same way, if the power amplifier or the loudspeakers aren't able to follow its virtuosity, you may miss its real value (it has a very good synergy, needless to say, with the same brand's power amplifiers). A last recommendation - be very careful with accessories placed below it (although with the A-5 I don't think it's particularly mandatory). In my case, cone feet produced horrible results, subtracting harmonics, treating the sound very badly. It was largely preferrable to use systems as the ART Q-Damper grafitis cubes placed beneath the original feet. The A-5 is one of those devices that at first leave the listener somewhat confused - actually, it's not common to meet such transparency, dynamics and care for the particulars in similarly priced gear. Yet, if it's easy and pleasant to get used to this quality level, it is rather difficult to separate from the A-5 (actually, you feel that part of your music will leave with it). For sure it is not a cheap object, but, considering what emerged during this test, quality/price ratio is, IMO, really very high. So, did AM Audio tech staff hit his goal? No doubt, a full shot! 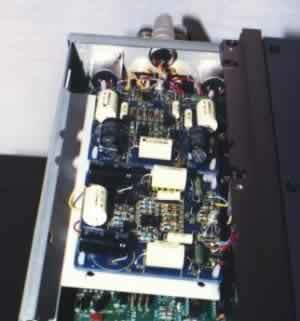 A thank-you to Attilio Conti for having given us his newest A-5 preamplifier presently tested.